Read the first volume for free via Goodreads. 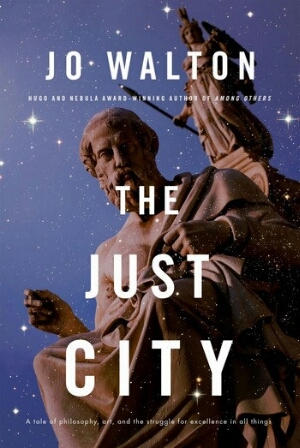 One day, in a moment of philosophical puckishness, the time-travelling goddess Pallas Athene decides to put Plato to the test and create the Just City. She locates the City on a Mediterranean island and populates it with over ten thousand children and a few hundred adult from all eras of history . . . along with some handy robots from the far human future. What happens next is a tale only the brilliant Jo Walton could tell. You can read the first five chapters for free here. And you can also enter to win a print copy here.